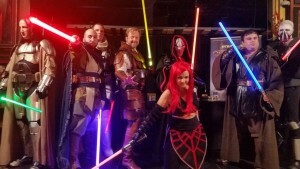 BioWare had an official SWTOR Cosplay play contest Thursday night, October 8th, 2015. It was held during the New York Community Cantina. There were seven registered contestants and they had some pretty amazing outfits. The participants had to have a SWTOR inspired costume. Some were classic inspired figures and newer figures from Blur trailers, while others were completely original and even inspired by their own toons. The first round of judging was up to the onstage panel. The judges were Lead Designer – Michael Backus, Prop Maker – Taras Harkavyi and Community Manager – Tait Watson. The first round results had three people moving on to the final round where the fans at the Cantina and those online took time and voted. The winner was dressed up as one of the twins from the Knights of the Fallen Empire Sacrifice trailer, Arcann. Congratulations to the winner and all those who took part in this streaming event. There were a few questions for Michael Backus, but nothing new was revealed in the very brief Q&A. If you did miss the Cosplay Contest you can click on the link from Dulfy’s website. There are also some images there of the contestants even a couple cosplayers that showed up after the contest had started. Which costume was your favorite? Let us know in the comment section below. Happy October! Join Heather and Jason this Sunday, Oct. 18th, 2015, at 4pm EDT / 1pm PDT. We will be celebrating the upcoming expansion release and our predictions/excitement for Knights of the Fallen Empire. We would love to see you in the chatroom during the show. • Conquest Mat called “Strategic Resource Matrix”. • Operation Mat called “Dark Matter Catalyst”. The Conquest Mat can only be acquired by completing your personal conquest goal. The Operation Mat can only be acquired by killing bosses in Operations. The Conquest Mat is used to craft Endgame equivalent gear. This gear is initially trainable from your trainer. You can then reverse engineer it to Storymode-equivalent gear, and again to Hardmode-equivalent gear. • This gear is un-moddable, Bind-on-Equip, and slightly better than the gear found on the vendors. • Mods and Relics cannot be crafted. The Operation Mat is used to craft raid gear and mods. This gear requires you to acquire the raid item first to reverse engineer. 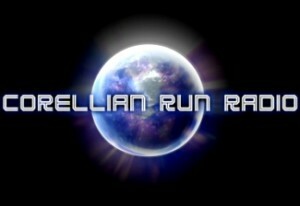 • Only Mods, Relics, Implants, and Earpieces can be crafted with this material. Hope that helps — keep the feedback coming! Nick has posted the above dev post to try and help clarify endgame crafting. Yes, it has cleared up some things and now there seem to be more questions. The clarification on crafting materials relating to Conquest rewards and Operational materials was good. We now know each of these avenues will provide needed mats. Crafters can then use the mats to craft Story-mode level gear and reverse engineer it to then craft the next tier. I like the premise of crafters working with Op teams to gather mats to then be able to create the higher level gear, even if it is not Best in Slot (BiS). The issue I have is the type of gear the endgame gear is. This gear will be un-moddable. How exactly will this work? How can a min-maxer tweek their gear a particular way? The issue happens when a player gets their first set piece. How do they add this to their gear? This seems like this was not thought out exactly. Un-moddable gear is hardly used for leveling, let alone taking into operations. Perhaps I am not fully understanding how this system will work. It would not be the first time for that. Let’s hope some more clarification from BioWare will be provided before Early Access. I wanted to pass on some information regarding changes to Companion Achievements in Knights of the Fallen Empire. As many of you know, Affection is being changed to Influence to coincide with your Character’s Alliance. Due to this, we are going to be removing all of the “Reach Max Affection” Achievements from the game, along with the Achievement points which they have granted. We didn’t want to create a situation where a very large number of Achievement points was no longer accessible. You can click the spoiler tag below to see a full list of all of the Achievements being removed. We have increased the point values for the “Kill 1,000” Achievements from 5 to 20. We have added a new “Devotion to the [Class]” Achievement for completing all of the “Kill 1,000” Achievements for a given Class/Faction. When completed, you will be granted the Imperial/Republic Squad Commander title respectively. We have added “Kill x” Achievements for both ship droids. BioWare announced via Eric’s post how they will be changing some of the achievements associated with companions. This initial post gave players a heads-up as to which achievements and how they would change. As a result of this post, I am finishing up a few companions affection to 10,000. I am also working to get the 1,000 kills per companions. A good tip, switch out your active companions that need kills before going into an Operation. All the kills from that Operation count towards that total. There are a few more dev posts talking about the changes for achievements. Take time to read through them and let us know in the comment section what you think. I have seen some questions about the Global Legacy Unlocks tied to Companions (the Presence bonus and reduced CD on Heroic Moment). Those are remaining exactly the same, so the benefit is still there for maxing your companions Affection and completing their storylines. I am glad to read that the cooldown reduction on Heroic Moment and Presence bonus will continue after the expansion goes live. The changes are great, but glad to see they are not removing these benefits that players earned. Hopefully right up until Early Access we will continue to learn more details about the expansion. Will the new Squad Commander and Devotion to X titles be retroactive if we have the kill 1000 enemies achievements pre-4.0? Edited to reflect both titles. Does it mean there won’t be any new Influence achievements either (i.e. “Reach Influence 10 with Lana”)? That is correct, there are no Influence Achievements planned to be live in Fallen Empire. However, we certainly could add them in the future (and have them be retroactive). I have mixed feelings on the answer for these two questions. On the one hand, the older titles will still be obtainable after the expansion hits live servers on the 19th with Early Access. As far as no new Influence achievements, I am a little bummed. This has me concerned there will not be many conversations etc. but, Eric follows that up with they could add them later. I’m crossing my fingers this means more interaction with our companions. How do you feel about the achievement changes for companions? Please take some time to submit your thoughts in the comment section below. There seems to be some kind of Star Wars buzz around every corner. Besides SWTOR’s new expansion, open-beta for Star Wars Battlefront both amassing more and more excitement, next to join the Star Wars buzz is the highly anticipated start to Star Wars Rebels season two. Since the trailer was released for season two, to say it is trending would be an understatement. 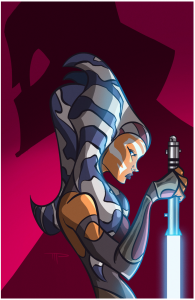 As part of the hype, StarWars.com has announced winners for their fan art contest for Star Wars Rebels. In the news article, on StarWars.com, it shows the three named winners. Sara and Alannah were both runners-up in the contest with the winner Michael. Below is the winner’s fan art. Congrats to all those who entered and to the three winners. Be sure to check out the other two winners and the article on the StarWars.com website. Don’t forget to watch the season two premiere, Oct. 14, at 9:30pm EDT. This week we have another creative music video from YouTube user Almighty SW Gamer. The music is Skyfall by Adele. It of course is from the James Bond movie “Skyfall.” It is a great piece of music, even if the remix version. The best part of the video is the two players in the video are a couple and showcase their gameplay and fun ingame. 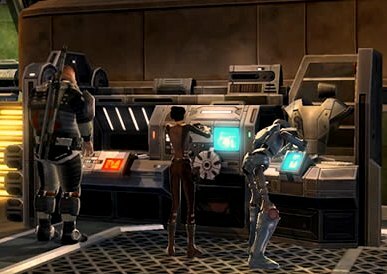 SWTOR is fun, but when you play the game with others, especially a loved one is awesome.